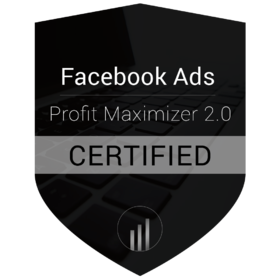 Congratulations on successfully completing the Facebook™ Ads Profit Maximizer Bootcamp 2.0 course and achieving the designation of Certified Facebook™ Ads Profit Maximizer 2.0 Media Buyer. I am pleased to issue your official badge, and encourage you to share it with the world. But remember, what’s far more valuable than any badge or certificate is the knowledge you now have. So again, congratulations on a job well done! - Jason Hornung, President, JH Media, LLC. Facebook™ Ads Profit Maximizer certified media buyers are uniquely qualified to help businesses create profitable advertising on the Facebook™ ads platform. These media buyers have demonstrated mastery of the 6 Step Facebook Conversion Code™ proven to generate $2 to $1 returns on ad spend (or more) with Facebook™ ads. Recipients of the "Facebook™ Ads Profit Maximizer Certification Bootcamp 2.0" must complete and advanced multi-module lesson program. This includes passing multiple quizzes and a thorough final exam to demonstrate mastery of the material. This training and exam ensure the public that the certificate holder has a high level of competence to engage in the professional practice of buying media on the Facebook™ ads platform.